M T D D e c e m b e r 2 0 1 8 10 N e w s / V i e w s Bridgestone adds capacity Bridgestone Americas Inc. plans to break ground on a three-year, $40 million expan- sion project at its Warren County, Tenn., truck and bus radial (TBR) tire manufactur- ing plant by the end of 2018. Franchisee is honored Judd Shader, founder and CEO of Leeds West Groups, has received franchisee of the year honors from the International Franchise Association and from Midas. In October Leeds West opened its 100th store — a Midas location — in Aurora, Colo. Leeds West also operates Big O Tires and SpeeDee Oil Change stores. TireGet offers financing Online tire retailer TireGet has added 6- and 12-month no-interest financing for consum- ers through a partnership with Synchrony Financial. TireGet says shoppers will have access to Synchrony's 25,000 tire installer partners. ALI elects chairman Jerome Lentz of Challenger Lifts Inc. has been elected chairman of the Automotive Lift Institute (ALI), the trade association dedicated to vehicle lift safety. Coker Group is sold The Coker family has sold the Coker Group to the company's CEO and president, Wade Kawasaki, along with members of the company's leadership team and Irving Place Capital. The Coker Group consists of the Coker Tire, Wheel Vintiques, Universal Vintage Tire, Phoenix Race Tires, Specialty Wheel and Roadster Wire Wheel brands. EXCEED is refreshed Yokohama Tire Corp. has redesigned its Excellence Through Certification & Education (EXCEED) online dealer train- ing program. The interactive program features updated content and streamlined access to product modules. Online store is renamed Wilcox Supply Inc. has renamed and rebranded its online store which sells tire supplies and tire equipment to tire retailers. The online business will be known as Tire Supply Network. The online store launched earlier this year under a different name — Discount Tire Supply. Bites Max Finkelstein adds consumer tires from Bridgestone W holesale tire distributor Max Finkelstein Inc. has added Bridgestone, Firestone and Fuzion to its stable of consumer tire brands. 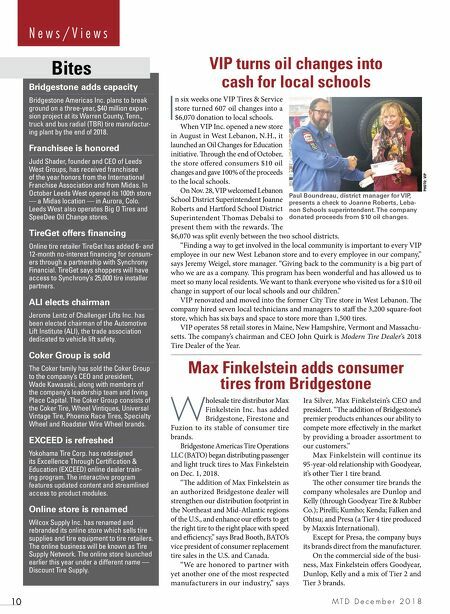 Bridgestone Americas Tire Operations LLC (BATO) began distributing passenger and light truck tires to Max Finkelstein on Dec. 1, 2018. "e addition of Max Finkelstein as an authorized Bridgestone dealer will strengthen our distribution footprint in the Northeast and Mid-Atlantic regions of the U.S., and enhance our efforts to get the right tire to the right place with speed and efficiency," says Brad Booth, BATO's vice president of consumer replacement tire sales in the U.S. and Canada. "We are honored to partner with yet another one of the most respected manufacturers in our industry," says Ira Silver, Max Finkelstein's CEO and president. "e addition of Bridgestone's premier products enhances our ability to compete more effectively in the market by providing a broader assortment to our customers." 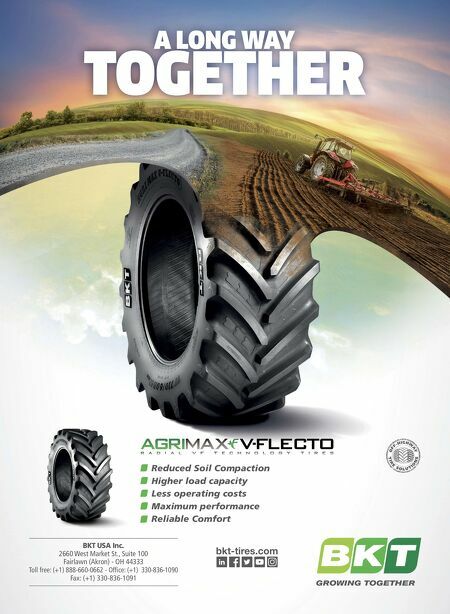 Max Finkelstein will continue its 95-year-old relationship with Goodyear, it's other Tier 1 tire brand. e other consumer tire brands the company wholesales are Dunlop and Kelly (through Goodyear Tire & Rubber Co.); Pirelli; Kumho; Kenda; Falken and Ohtsu; and Presa (a Tier 4 tire produced by Maxxis International). Except for Presa, the company buys its brands direct from the manufacturer. On the commercial side of the busi- ness, Max Finkelstein offers Goodyear, Dunlop, Kelly and a mix of Tier 2 and Tier 3 brands. PHOTO: VIP VIP turns oil changes into cash for local schools I n six weeks one VIP Tires & Service store turned 607 oil changes into a $6,070 donation to local schools. When VIP Inc. opened a new store in August in West Lebanon, N.H., it launched an Oil Changes for Education initiative. rough the end of October, the store offered consumers $10 oil changes and gave 100% of the proceeds to the local schools. On Nov. 28, VIP welcomed Lebanon School District Superintendent Joanne Roberts and Hartford School District Superintendent Thomas Debalsi to present them with the rewards. e $6,070 was split evenly between the two school districts. "Finding a way to get involved in the local community is important to every VIP employee in our new West Lebanon store and to every employee in our company," says Jeremy Weigel, store manager. "Giving back to the community is a big part of who we are as a company. is program has been wonderful and has allowed us to meet so many local residents. We want to thank everyone who visited us for a $10 oil change in support of our local schools and our children." VIP renovated and moved into the former City Tire store in West Lebanon. e company hired seven local technicians and managers to staff the 3,200 square-foot store, which has six bays and space to store more than 1,500 tires. VIP operates 58 retail stores in Maine, New Hampshire, Vermont and Massachu- setts. e company's chairman and CEO John Quirk is Modern Tire Dealer's 2018 Tire Dealer of the Year. Paul Boundreau, district manager for VIP, presents a check to Joanne Roberts, Leba- non Schools superintendent. The company donated proceeds from $10 oil changes.